In 2017 DropBox Inc. built another impressive list of shipping container modifications for customers around the world. From standard product offerings like our Blast Resistant Modules, running water restrooms, and tank boxes to more custom units like tool and equipment storage units, chemical labs, and more. This week we'd like to take the opportunity to look back on some of the shipping container modifications we built for our customers. Give it a look and let us know what you think! We're not the only company in the shipping container modification business. 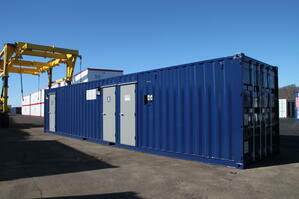 In fact, there are a lot of companies that modify shipping containers into a wide range of solutions. While we may be a little biased in saying that we’re the best at what we do, we can't help but be humbled by the fantastic creations other shipping container modification companies are building these days. With that in in mind, we'd like to use this week’s Shipping Container Mods Blog to share some stories of shipping container modifications from around the world. 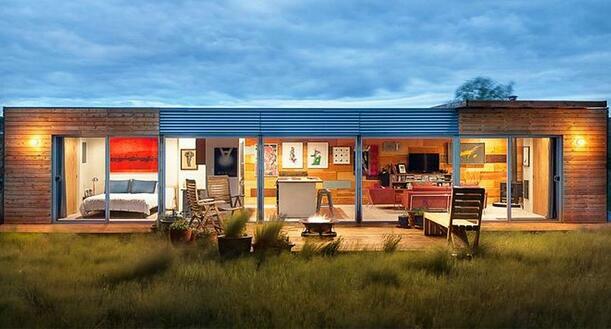 1: This Stunning Shipping Container Home Can Be Yours for $125K. An architect from Seattle wanted to design an off-the-grid shipping container home in the picturesque landscape of Montana. Well, he did it – and from the pictures it looks fantastic! Click the above link, read the article, look at the pictures, and contact your mortgage broker. This beautiful home can be yours! 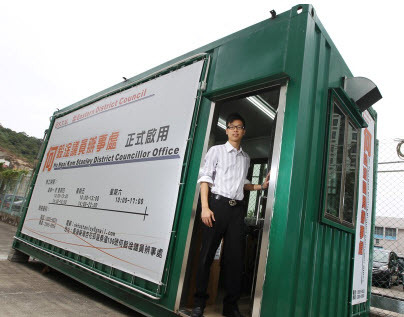 2: Plans for Container Homes in Hong Kong get a Mixed Reaction from Experts. Give this article a read to gain insight on what some different opinions are when it comes to using shipping containers as housing. As with anything else there are always going to be pros and cons, and this article discusses many differing views on proposed shipping container solutions to address Hong Kong’s growing population and economic challenges. 3: Invention Solving Worldwide Sewage Woes, Producing Clean Water, Power and Food. 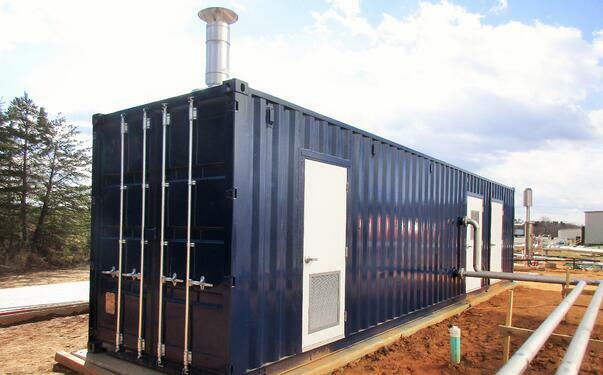 In order to help address some of the concerns created by “rapid, unplanned urbanization” the Bill & Melinda Gates Foundation has granted $1.14 million to install a product called a “NEWgenerator” alongside government-provided modified shipping containers that include showers, sinks, and toilets in Durban, South Africa. The project seeks to alleviate strain that temporary settlements have placed on sewer systems. To learn more about how the NEWgenerator works and why it makes such a great pairing with the shipping container modifications, click the link above. 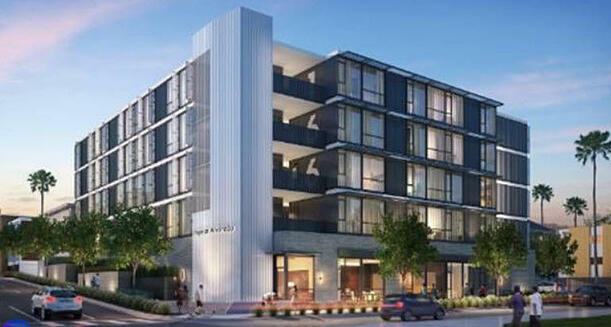 4: How Shipping Containers are Transforming Housing for the Homeless. Along the lines of the second article we shared today, and of a very different opinion than some of those represented in the above article, the Los Angeles County Department of Health in California and Aedis Real Estate Group believe that shipping containers will be an efficient and economical way to address chronic homelessness. If you want to know more about what they’ve teamed up to do, click the link above. Down in Miami, Florida planning and zoning rules can be pretty strict when it comes to "pop-up” businesses. 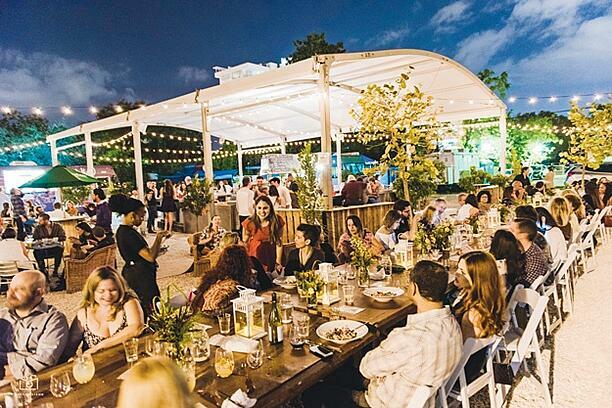 Della Heiman, the founder of The Wynwood Yard (a community pop-up “hub” of sorts in Miami) recently asked city commissioners to amend current legislation to extend time limits on temporary business structures in order to help spark entrepreneurship and community growth. This article addresses many different types of start-ups, and specifically mentions a full-service restaurant built from modified shipping containers, and a model container home used as a showroom and for event rentals. We hope you enjoy these stories as much as we did, and if you have some ideas in mind for your own shipping container modifications, feel free to point-and-click and explore our site to see what we can do for you. You can CONTACT US HERE or give us a call at 740.532.7822. 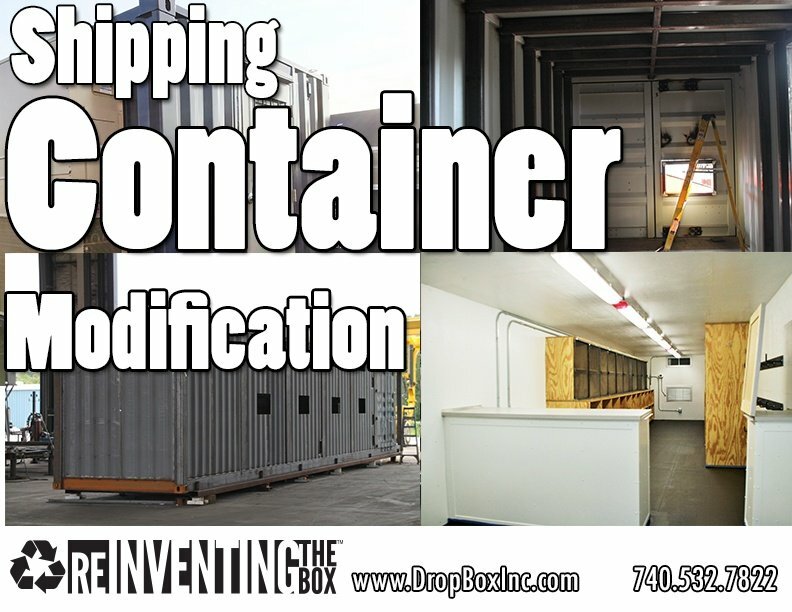 At DropBox Inc. located in Worthington, KY, we strive to offer our clients the shipping container modifications they need. To achieve this often lofty goal, we custom design and engineer each shipping container modification to meet our customers’ site-specific requests. Our in-house team of expert engineers, CAD draftsmen, and manufacturing staff can carry out virtually any shipping container modification imaginable. 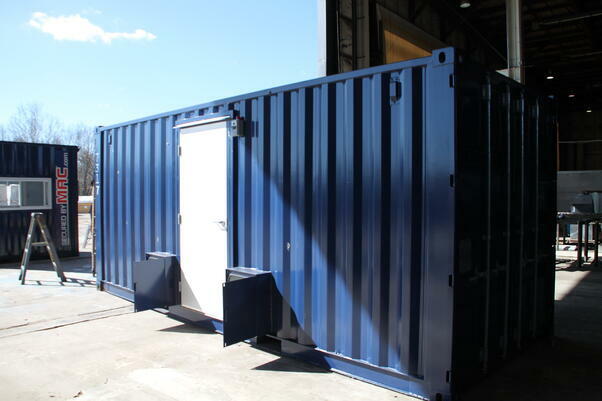 From something as simple as painting or the addition of a company logo, to a fully modified shipping container solution, we work within our clients’ specifications to create whatever portable solution is needed to meet the requirements of their project. The DropBox Inc. manufacturing team can take a standard ISO shipping containers in 20’ and 40’ lengths and create portable solutions complete with functional utilities, layouts, and the aesthetics required. 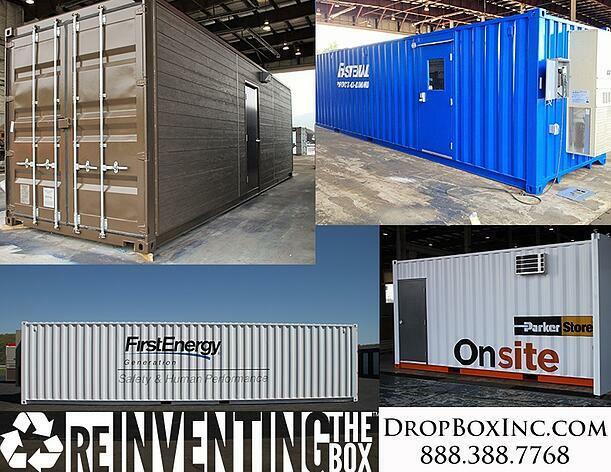 DropBox Inc. will customize shipping containers to include windows, doors, plumbing, and electrical systems. Our team can provide you with a turn-key built-to-suit structure that is fit to your job-specific requirements. Unlike a permanent, historically "stick-built" structure, a shipping container modification from DropBox Inc. has the added advantage of being portable from one job site to the next and may be used in multiple locations over the course of its life. At DropBox Inc. our engineers and technicians can modify shipping containers for virtually any use in any environment found on Earth. If you need additional office space, on-site restrooms or showers, or work stations, the DropBox Inc. team can help. Our highly skilled team of engineers can even "build up" by securely stacking multiple containers into a multi-story building; we can manufacture structures with both internal and external stairs. Long-term or short-term, DropBox Inc. can build temporary and permanent buildings, from on-site temporary workstations to permanent installation. 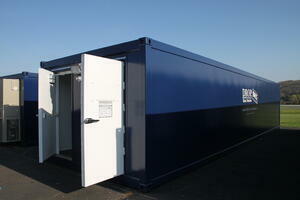 Large or small DropBox Inc. can supply the turn-key solution you need. DropBox Inc. offers both standard and custom exterior finishes for shipping container modifications. Because of the steel construction of the shipping containers we use to build, our products can receive a wide range of exterior treatments. Custom paint jobs, exterior facades, and decals – almost anything imaginable can be included as part of your shipping container modification from DropBox Inc. The finishes we provide in our shipping container modifications are built to withstand the harsh conditions of any environment on Earth. We've delivered units to extreme heat locations like the middle east, to the severe cold of Greenland. Our attention to detail, engineering, and design make our products suitable for every environment and every customer around the world. 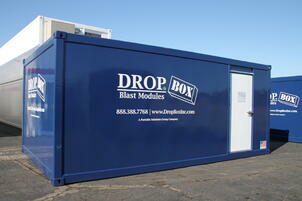 DropBox Inc. can take a standard shipping container and modify it for your specific application. 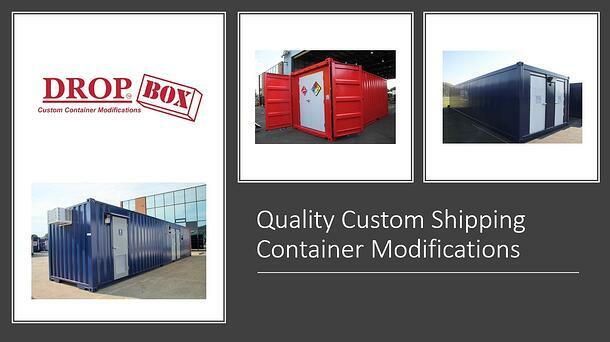 Our shipping container modification capabilities are limited only by the imagination of our customers. If you can think it we can build it into a box. From designing, engineering, and manufacturing to delivery, we will provide a turn-key portable solution regardless of your needs. 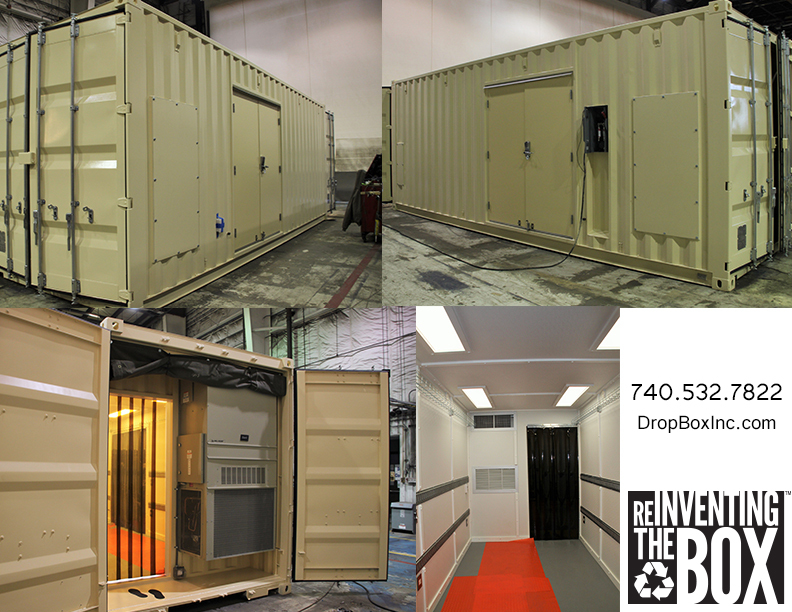 DropBox Inc. offers both standard and custom shipping container modifications for customers in both commercial and industrial settings. Given the steel construction and standardized features of shipping containers, they are the perfect building block for a wide range of products including restrooms, showers, ground-level offices, and even Blast Resistant Modules with additional structural steel reinforcements. ISO shipping containers are built to withstand the harsh conditions of ocean travel, making them suitable for any climate on earth. 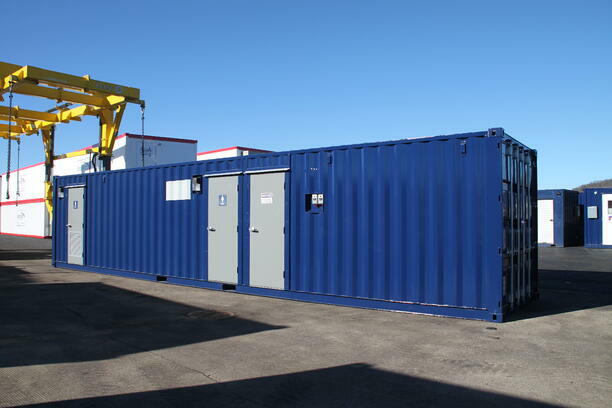 DropBox Inc. can take a standard shipping container and modify it to meet any need imaginable for industrial plants, commercial facilities, military installations, and even residential housing (where applicable). 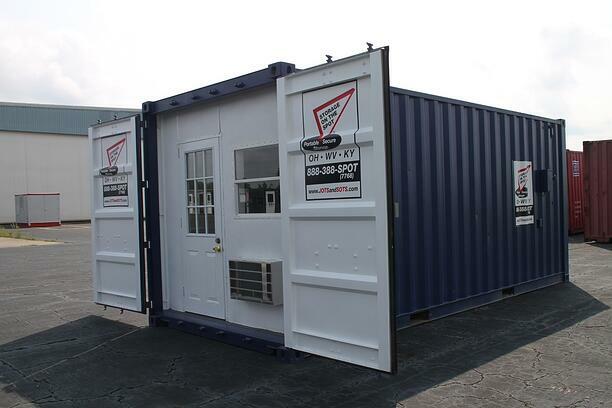 Most shipping containers have standardized swinging doors on one end, but rest assured we can add additional doors, windows, plumbing, lighting, electrical, exterior facades, and/or paint your unit whatever color you want. ISO shipping containers are built to last for decades and be stacked up to 10 high. When engineering and designing shipping container modifications for our customers, our design team takes great care to consider both the needs of our customers as well as how the unit will be used after it is complete. We have a qualified in-house CAD drafting team and engineers to resolve all of your design and engineering needs, regardless of the size of your project or the complexity of your specific build. In-House CAD Drafting/Engineering - DropBox Inc. provides a qualified staff of engineering and drafting professionals to resolve any and all design issues. Quality Licensed Craftsmanship - DropBox Inc. performs all our modifications in-house with nearly 100,000 sq ft of manufacturing space filled with qualified builders that are licensed and certified in their respective crafts/trades. Secure Supply Chain - If you buy a shipping container modification from DropBox Inc., DropBox Inc. builds it right here in the United States. We never outsource our modifications, and everything we build is Made in America. For more information about DropBox Inc. and all of our shipping container modifications CONTACT US HERE or call us toll free at 888.388.7768. 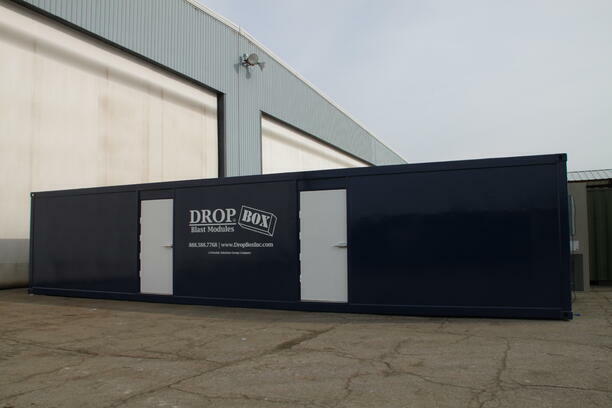 DropBox Inc. has well-established relationships within the ISO shipping container industry. Because of these relationships with reliable suppliers around the world, we can quickly provide you with the best, highest quality shipping containers and shipping container modifications possible. Our relationships are part of what makes DropBox Inc. stand out amongst other shipping container modification companies. 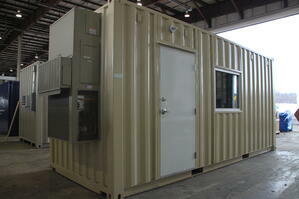 We carry a large selection of new ISO shipping containers that we use as our base for many of the products we build. 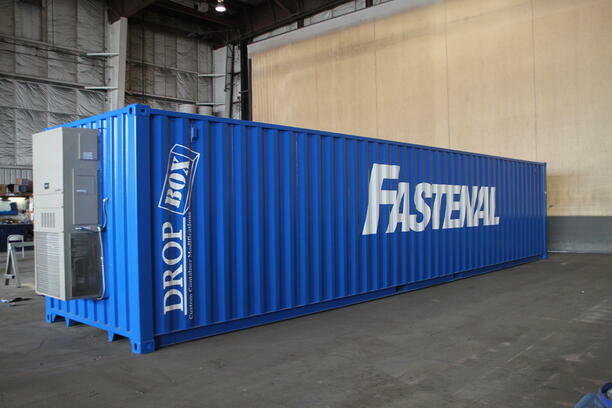 Rest assured that when you order an shipping container modification from DropBox Inc. you will get a fully designed and engineered product that is custom built from start to finish to meet your needs. In addition to a standard line of products like our Blast Resistant Modules, Running Water Restrooms, and Ground-Level DropOffices, we provide a wide range of custom options, custom floor plans, and custom designs. Our in-house CAD and engineering department is ready to make your shipping container modification dreams a reality. Portable, turn-key, and built to last, shipping container modifications provided by DropBox Inc. are ideal for a vast array of solutions. We have made a name for ourselves with customers around the world by turning simple steel shipping containers into usable work spaces, modules designed to house company specific products, industrial quality restrooms, and more. 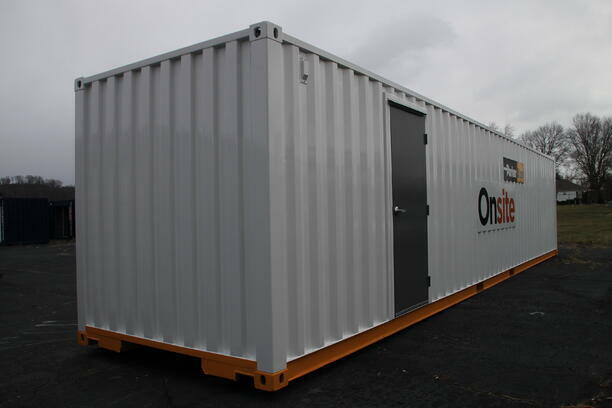 The modification of a shipping container for offices, restrooms, blast resistant modules, or modular housing for your company’s water filtration, and/or battery/inverter systems make our products both turn-key and easily installed and put to use. 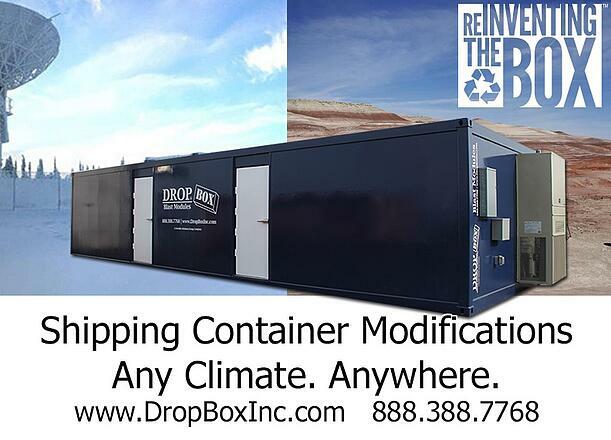 For more information about DropBox Inc. and all of our container modifications CONTACT US HERE or call us toll free at 888.388.7768. At DropBox Inc. we build almost anything imaginable through ISO shipping container modifications. While we do get rare requests for shipping containers to be built into homes and living spaces, we find that our most sought out modifications are far removed from those occasional residential requests. In this week’s edition of the Shipping Container Mods Blog we'd like to take a look at our top 5 most requested shipping container modifications. When it comes to worker safety there's no place safer for your employees to have lunch, hold meetings, take breaks, and store equipment in the blast zone than a Blast Resistant Module from DropBox Inc. With multiple floorplan options and an 8.0 PSI Overpressure rating, a BRM could literally be the difference between life or death for workers in refineries, chemical plants, and other jobsites dealing with the inherent risks of the work being done. You know the deal... People gotta go, even at work. And when it comes to a sanitary jobsite restroom there is no comparison to a containerized running water restroom from DropBox Inc. 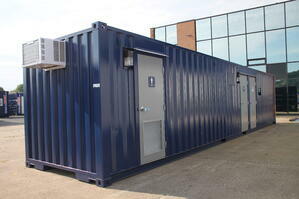 These units are climate controlled, insulated, and have running water and flushable toilets. Built to be either tied into existing water sewer lines or self-contained with holding tanks for fresh and waste water, these units may be set up virtually anywhere. Need a portable climate controlled space for your workers to hold meetings, take breaks, and grab a bite for lunch? Well we've got the perfect solution – and our customers know it. We get requests almost every day for our ground level offices, which are available in either 20' or 40' lengths and are 8' wide. 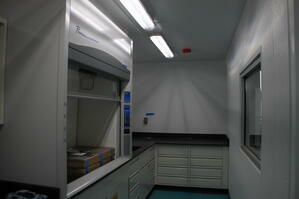 Got some nasty chemicals you need to keep stored in a climate controlled safe environment? 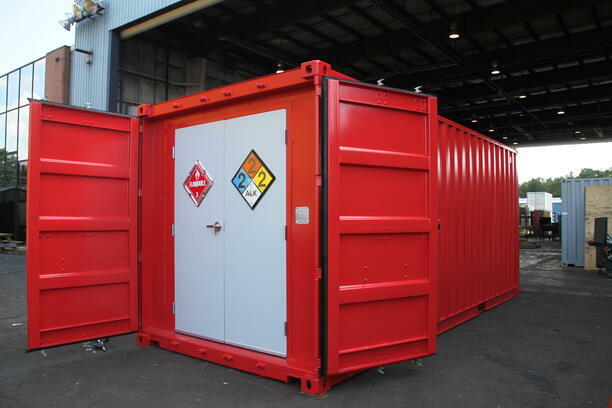 Customers around the world in that exact situation turn to DropBox Inc. for our fully designed and engineered Hazmat Chemical Storage Units. 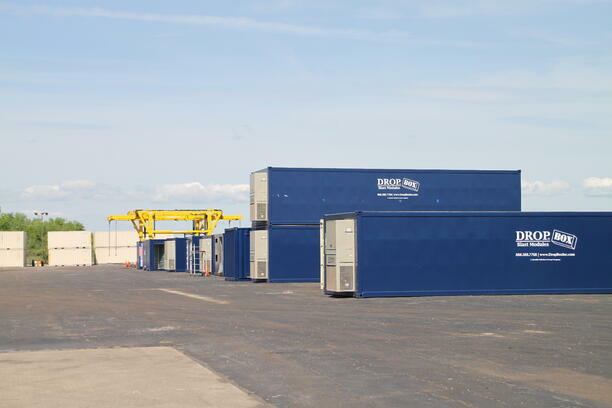 Offering a wide range of custom options, these 8' x 20' shipping container modifications have what it takes to keep your materials stored properly and safely. 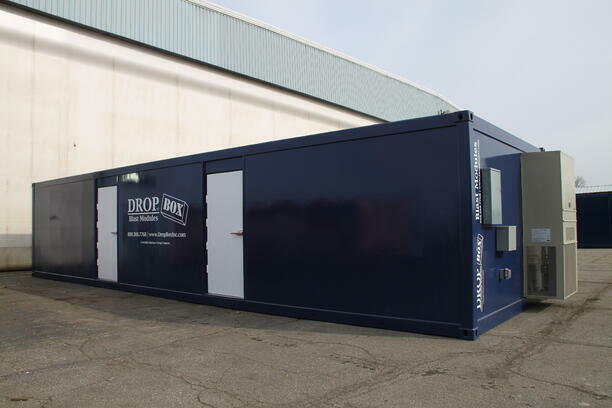 Whether you need a place to repair equipment, house tools, or train and test welders, DropBox Inc. has the shipping container modification solutions you need to get the job done. Over the years we have taken great pride in “ReInventing the Box” by building hose repair facilities, marine repair tool cribs, blast resistant tool storage, and many more modifications. For more information about DropBox Inc. and all of our ISO shipping container capabilities, CONTACT US HERE or call us toll free at 888.388.7768. Click above to start the video above and learn all you need to know about DropBox Inc. and our shipping container modification capabilities. Got an idea for a shipping container modification? CONTACT US HERE or call us toll free at 888.388.7768 to discuss your ideas and to learn more about our products and pricing. 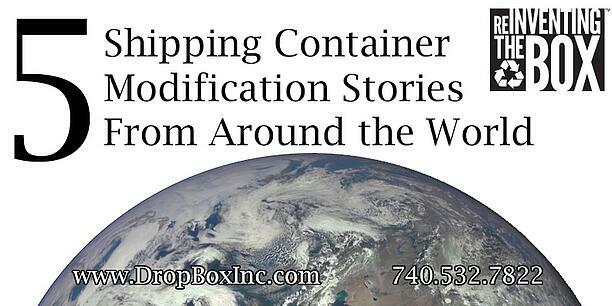 Also don't forget to subscribe to the Shipping Container Mods Blog as it is regularly updated!